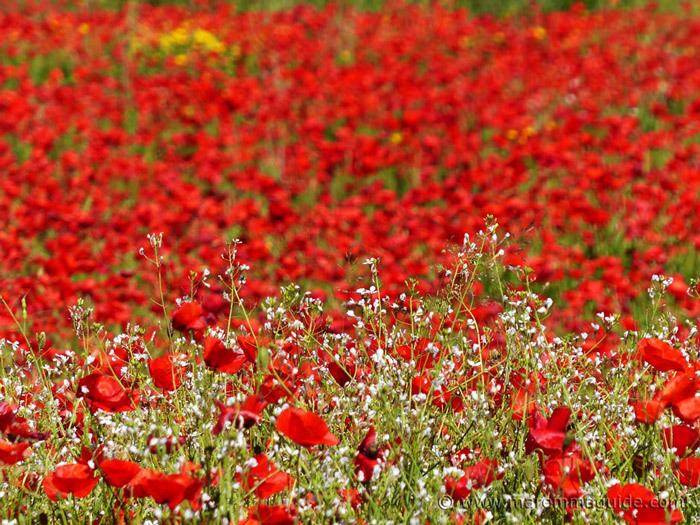 When is the best time to see flowers in Tuscany, wildflowers that is? 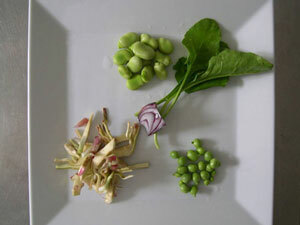 I'll cut to the chase, without a doubt, the best time is during the months of April and May. 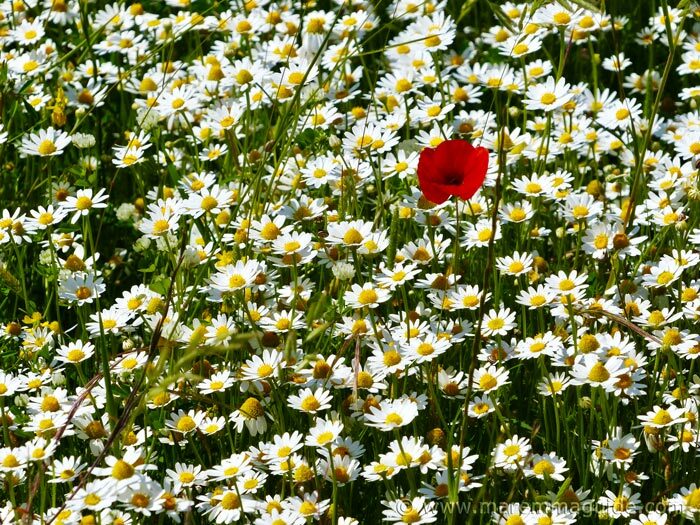 But I'm not just talking stunning fields of poppies in bloom, because when this part of Tuscany is in flower it has a few surprises too. 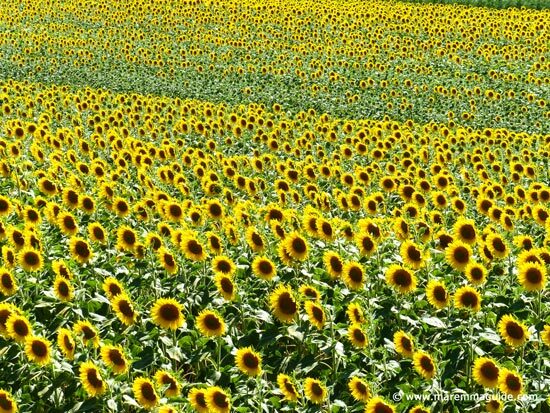 If it is field after field of smiling sunflowers that you want to see, then - depending upon when the sunflower seeds were planted and where - you will need to wait until June to see their happy faces. 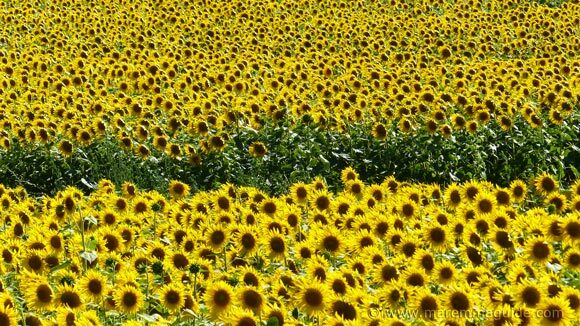 Maremma Tuscany sunflower fields near the coast. 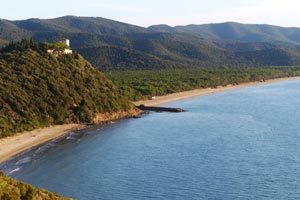 Behind a gorgeous long, long stretch of golden sands in the hamlet of Pian d'Alma, near the medieval hill and beach town of Castiglione della Pescaia. 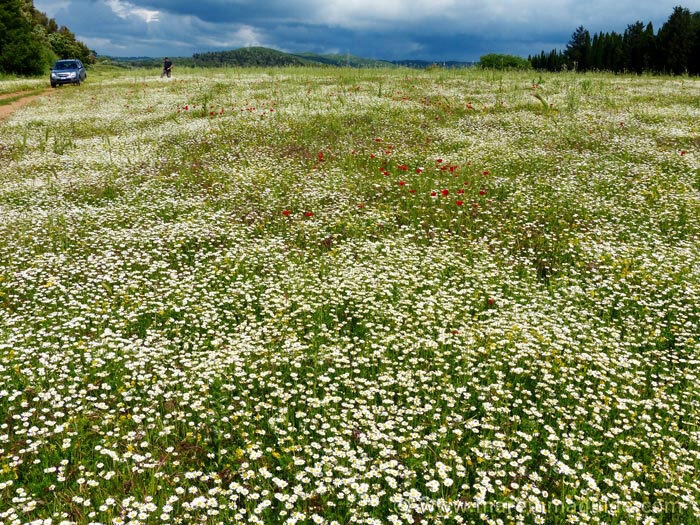 The best time to see spring wild flowers in Tuscany is during the months of April and May. 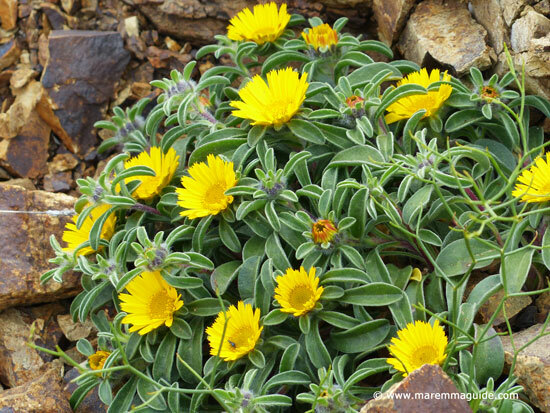 During March you will start to see some coming into flower, individual shots of welcome colour that are the tell tell sign that spring is definitely on its way, but not the full, road-side stopping, jaw-dropping, displays that you are probably hoping to see. 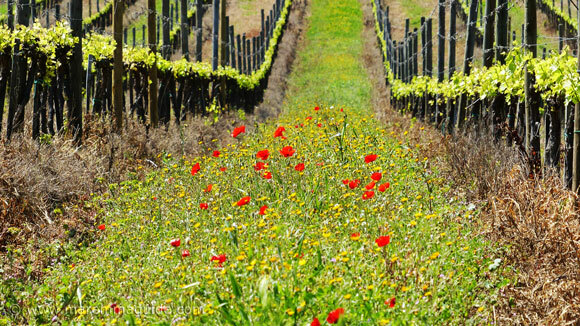 Poppies in bloom between the rows of vines in Tuscany in mid-April. 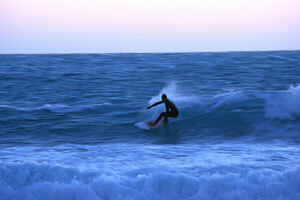 TIP If you are out early in the morning you can catch some great shots before the days light becomes intense. 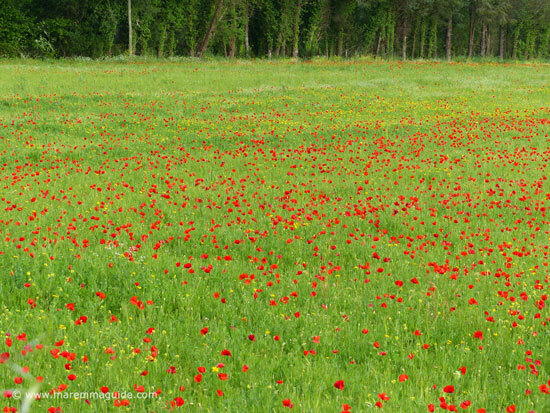 Early morning Tuscany poppies in May by the beautiful freshwater lake of the Lago dell'Accesa, near Massa Marittima. 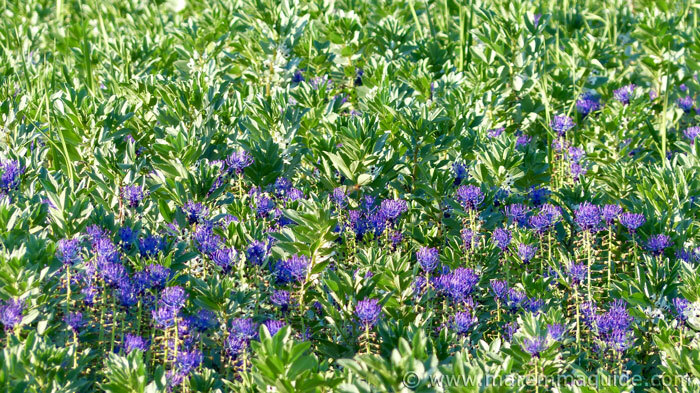 Wild legume growing amongst grain crops, right next door to olive groves painted red and yellow: sometimes it is hard to know where to look first! Wild climbing roses in bloom on the road to Gavorrano in May. 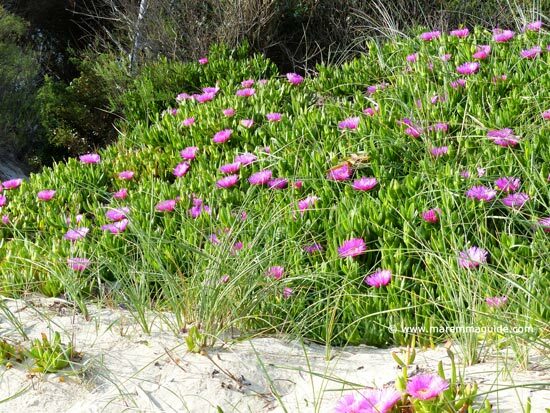 And in spring it isn't just Maremma's countryside and fields that are alive with flowers and colour, Maremma's beaches too are alive with blooms. 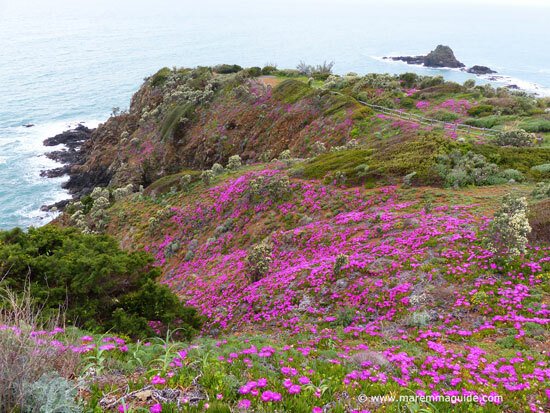 Maremma's coastline is dressed in shocking pink in the spring... not the subtle pale pink, but the shocking pink kind. 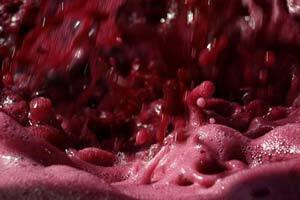 But mother nature carries this show off without even a hint of gaudiness, for where massive carpets of electric pink might be over the top in any other situation, her in Maremma in white sand dunes, they simply look stunning. 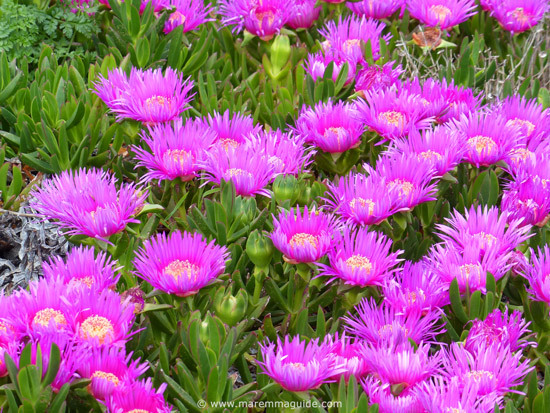 These are Sour Figs flowers of the succulent Carpobrotus acinaciformis in the dunes that back the lovely beach of Torre Mozza. But you will find them too behind the beaches that join Torre Mozza along the nature park of the Parco Costiero della Sterpaia. The dunes of Torre Mozza beach Tuscany in bloom in April. And here on the rocky shore coastline of another of Maremma's coastal parks, this time the Parco di Punta Falcone along the Costa degli Etruschi - the Etruscan Coast - just north of the port city of Piombino. 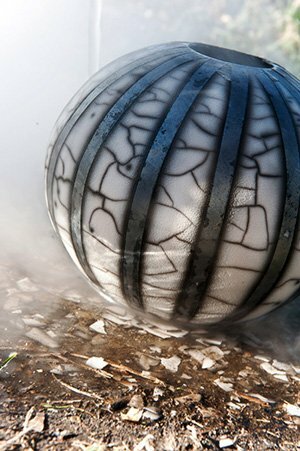 The park is home to many wild native plants, an astronomical observatory, and relics and monuments from the second World War. You get a great view from here of the ferries passing each other on the way to and from the Isola d'Elba, which sometimes feels so close that you could almost touch it. Parco di Punta Falcone in full bloom in April. 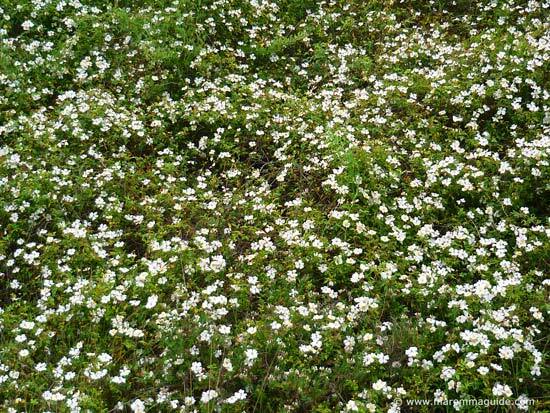 Amongst its carpet of pink of Sour Figs or Cistus incanus (locally known as Cistus Villoso), are the creamy-white flowers of the low growing bushes of "Barba di Giove" - Beard of Zeus (Anthyllis barba-jovis), once used for healing wounds. Yellow gorse, wispy pink thistles, and yellow daisies (I'm still trying to find out their name a I didn't photograph the tags - the park authorities have helpfully put name labels on the plants along the coastal pathway) growing amongst the rubble of broken pillow lavas. 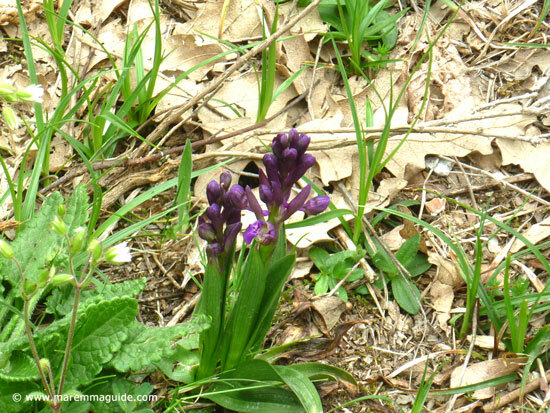 Inland, you will find wild purple orchids, anemones, crocuses and splashes of wild pink cyclamens in the woodland floor of the Riserva Naturale delle Cornate e Fosini, near the Tuscan hill town of Gerfalco. 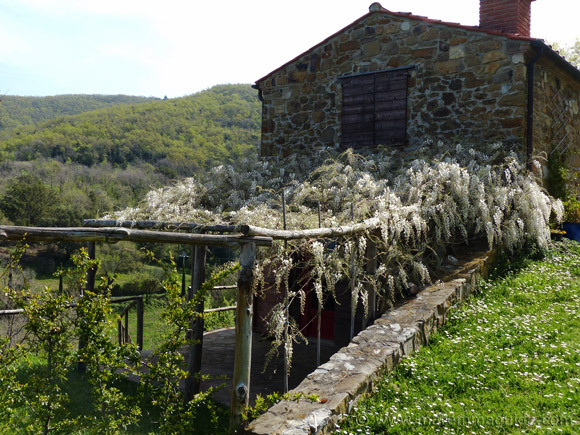 For a guided tour of this reserve, which is home to the limestone massif called the Cornate di Gerfalco (the highest hill in Maremma's metalliferous hills), two rare falcons, and ancient silver mines, contact the Simone and Fiona via the form at the bottom of this page. Orchidaceae in flower in late April in Maremma. 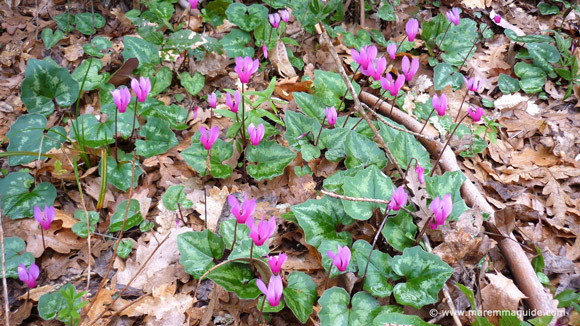 Clusters of tiny cyclamens can be found in many of Maremma's woodlands where the light reaches the forest floor - especially alongside the footpaths and in openings amongst the fallen stones that once were the walls of Etruscan tombs. Be prepared to want to stop your car a lot when you realise what those streaks of pink are as you drive along, because the sides and banks of country roads in this part of Tuscany are covered in them too! 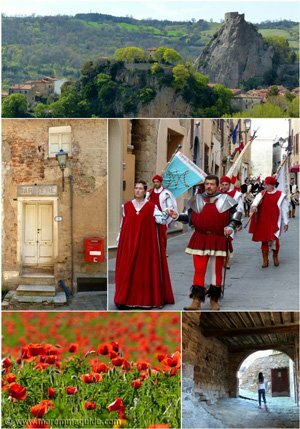 Visiting Tuscany: April or May? 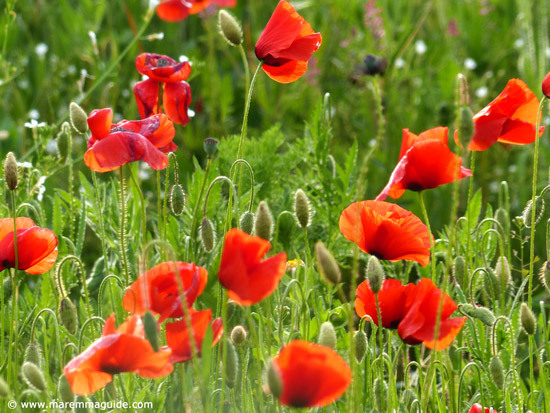 If you have the choice and don't know which month to choose to visit Tuscany and would love to see these wild flowers and more, then opt for the month of May. The colours are more intense and the weather is usually - I say usually as nothing weather wise seems to play along traditional historic patterns these days! 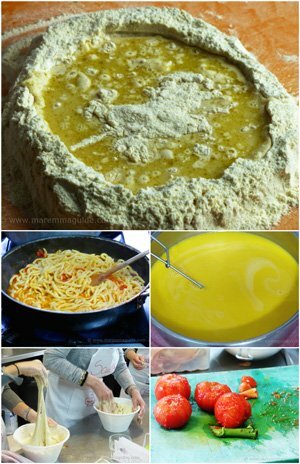 - warmer and you are guaranteed more sunshine. 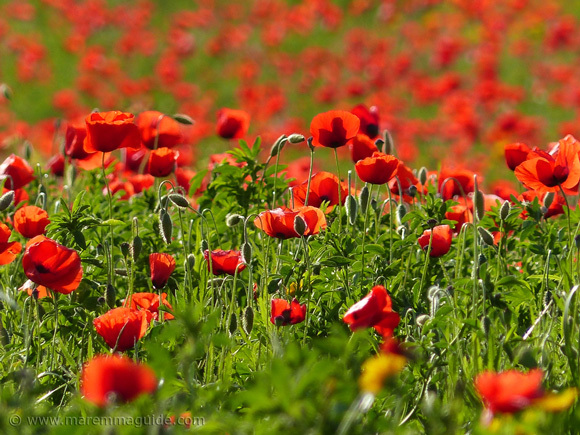 When do poppies bloom in Tuscany Italy? 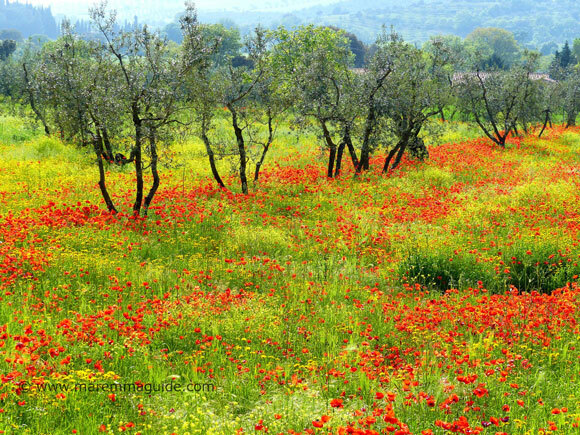 When do poppies bloom in Tuscany Italy? 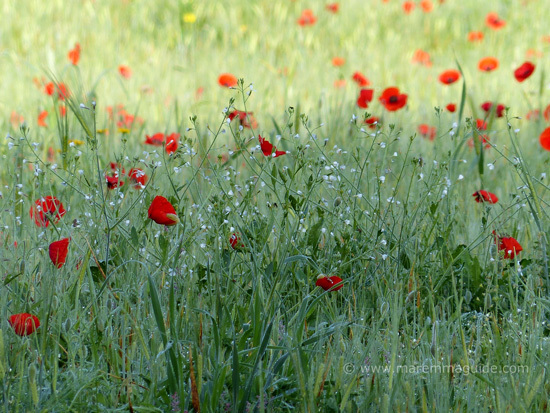 You will start to see a few poppies here and there, popping their heads up amongst the vivid green of Maremma's fields and along the roadsides, during the month of April. May is lush green backdrops with splashes of colour. 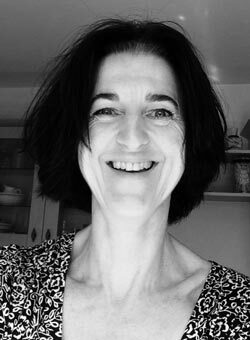 This first picture was taken on the 4 May. 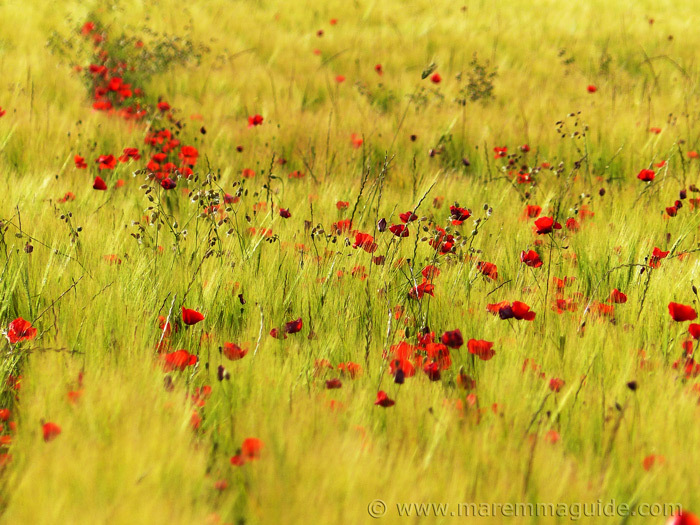 Poppy field in bloom early May in Maremma Tuscany Italy. Tuscany poppy field in bloom in Tuscany the middle of May. And then two weeks later on, on the 28th of May. 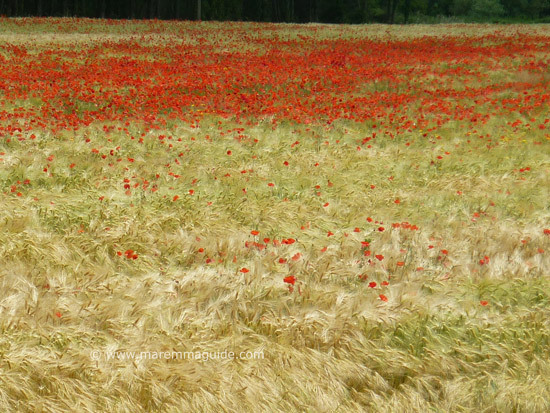 Tuscany poppies at the end of May. 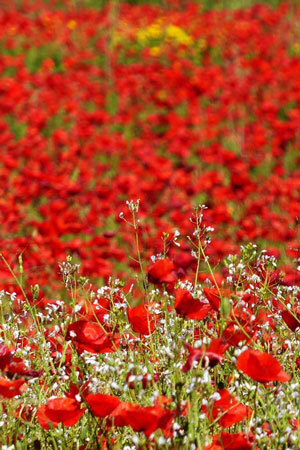 A month later in June and the sun has scorched the fields and the lush green and poppies have all but disappeared. 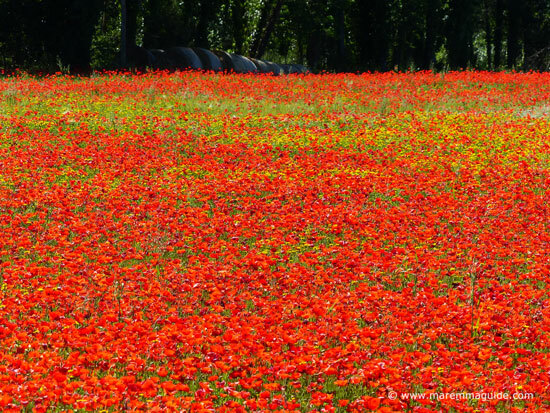 But red isn't the only colour you will see in in Tuscany in May, for what at a distance might seem to be more poppies is in fact, when you get closer an incredible pink turning into red! 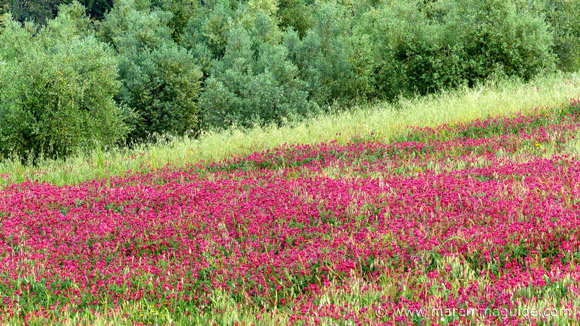 I saw these wild flowers in bloom on a hillside below Massa Marittima as I was out on a cylce ride one early evening towards the end of May. 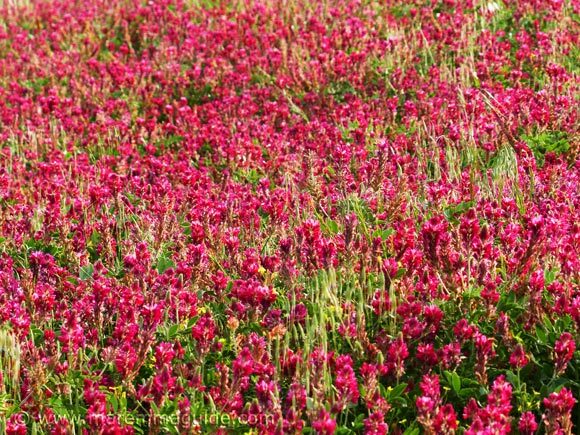 As I walked up the hill to reach what I thought at first was a swathe of red poppies, with each step closer the red turned pinker and pinker, until I was deep in wild Sulla - "lupinella selvatica", (French honeysuckle, Hedysarum coronarium) - flowers. 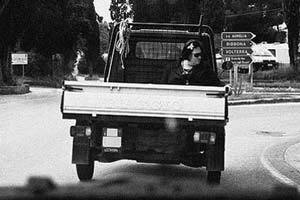 The weather throughout May in Tuscany last year had us drenched nearly every day with downpours that felt like someone was emptying a bucket over our heads. And when the final count is taken, will probably be declared as the wettest May on record. 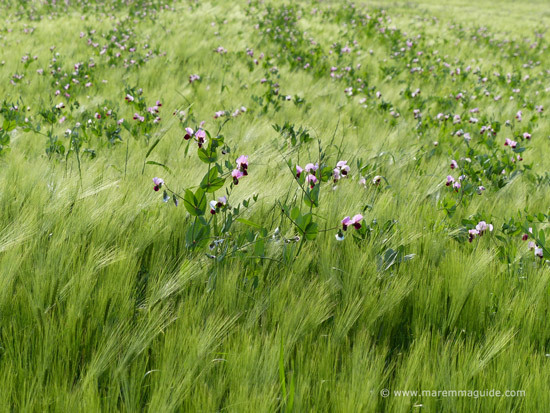 But all that rain - and golf ball sized hail - didn't dampening the spirits because the crops and wild flowers loved it. 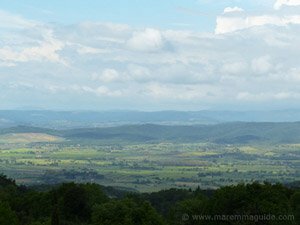 This is what my part of the world in Maremma looked like in the first few days of June. 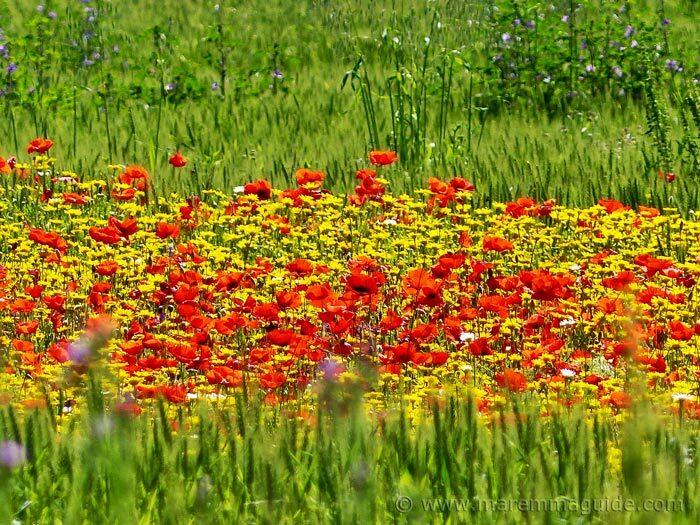 Although the meadows in Maremma are no longer filled with millions of flowers, the height of the summer months in Tuscany will still delight you with flowers and in places you won't expect. In the dunes behind the beach, and in the rocky coves of headlands. 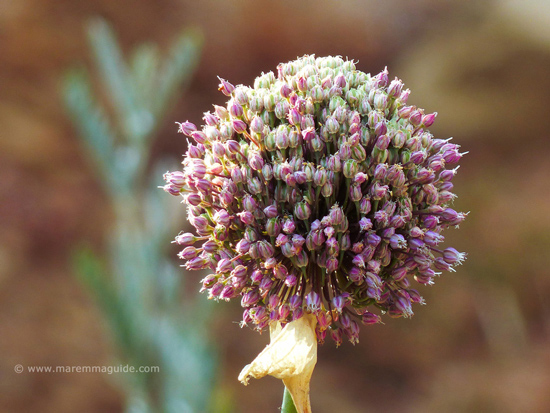 A head of Allium flowers at the beginning of July on the Poggettone beach near Punta Ala: a quite spot you can have all to yourselves when everyone else is on the sandy beach around the corner. 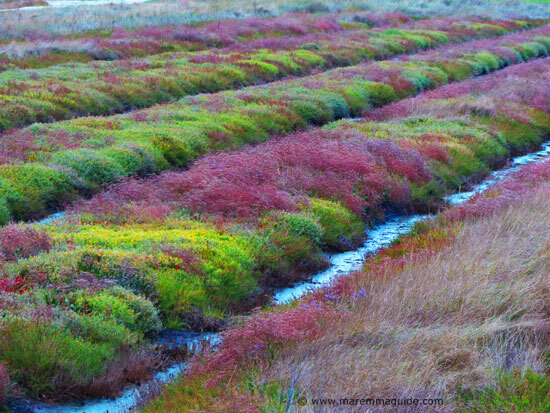 In the autumn months, Maremma's wetlands and marshes are in full flower. Sometimes with watercolour-like washes of red and pink hues, and sometimes patchwork quilts of much more vibrant contrasts. This is mid October in the Parco Costiero della Sterpaia in the Gulfo di Follonica. This time a landscape photographers dream location. 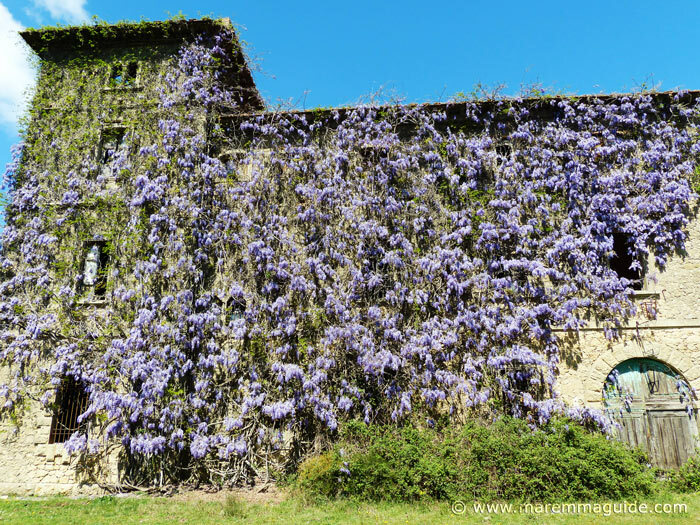 And whilst the purple flower heads of the banks of huge thistles that line the canals and river ways along Maremma's coastal plains have come and gone, the captivating structural heads remain. 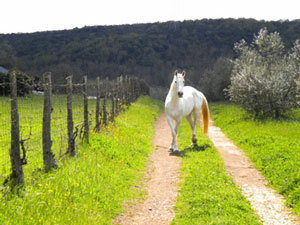 These can be found at the Casa Ximenes in the Diaccia Botrona reserve near Castiglione della Pescaia. 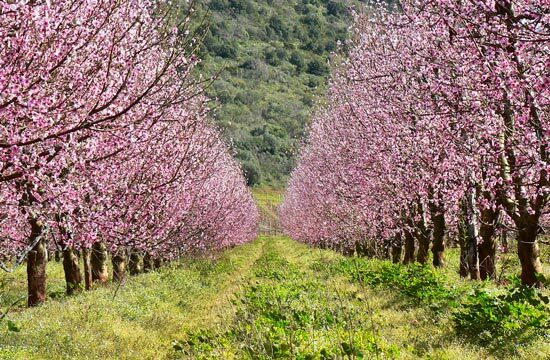 Maremma's farms are home to fruit orchards and agricultural crops whose flowers light-up the early spring days: fields of fleeting pink and white blossoms of cherry, peach, apricot, apple and pear trees, against the dark brown branches and vivid green grasses. 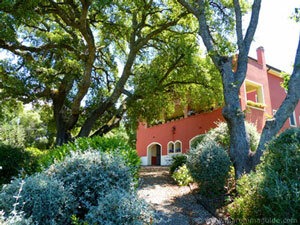 And in hill top gardens the wisteria blooms in pure white and shades of lilac. Followed by brilliant fields of yellow that contrast so vividly with blazing bright blue April skies. The mustard crop might not be wild, but it is no less dramatic and had me and many other local Maremma photographers stopping and making special trips to take photographs here along the road between Massa Marittima and Follonica, near the hamlet of Cura Nuova (which is a great restaurant, Italian deli and local wine stop by the way!). Photograph taken on 23 April. 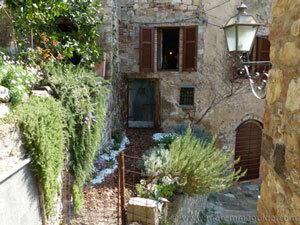 When do sunflowers bloom in Tuscany? 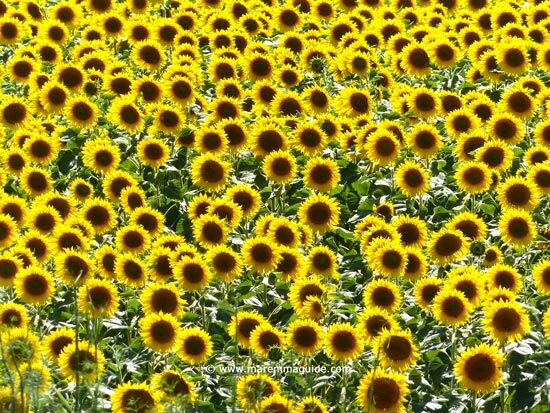 The Tuscany sunflower season in Maremma lasts throughout the summer months. The first of those planted will start to flower in early June, but you will be able to see fields like these in July and August too. 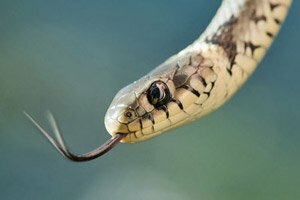 If you are visiting in September, you will still be able to see some tall latecomers smiling away amongst those that have long since dried and turned a golden brown. Just as beautiful if not more so, finding their own place in this world apart from the masses. But you will have missed the major part of the show. 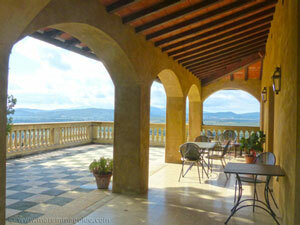 Where can you see sunflowers in Maremma Tuscany? 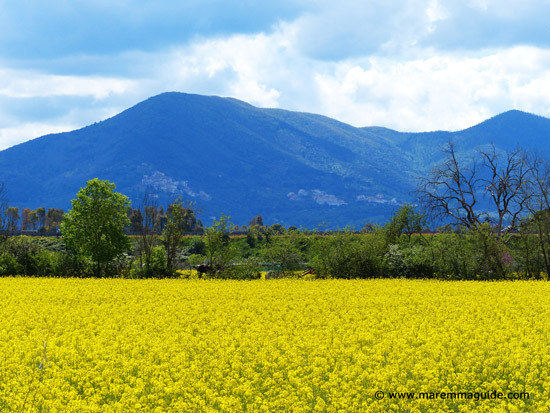 But you only have to take a drive to a high point near Maremma's coastal plains and look at the panorama around you to spot lots of other locations: their bright yellow can't be missed. 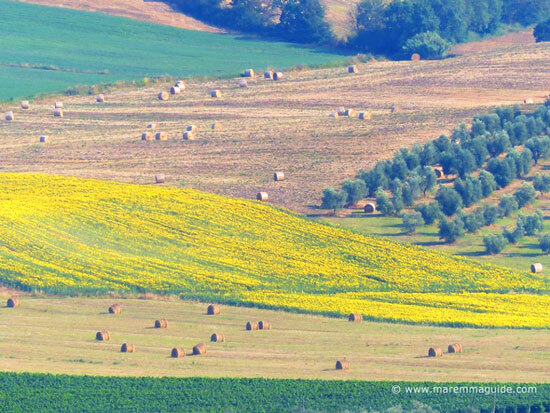 Tuscany sunflower fields from Montemassi castle. 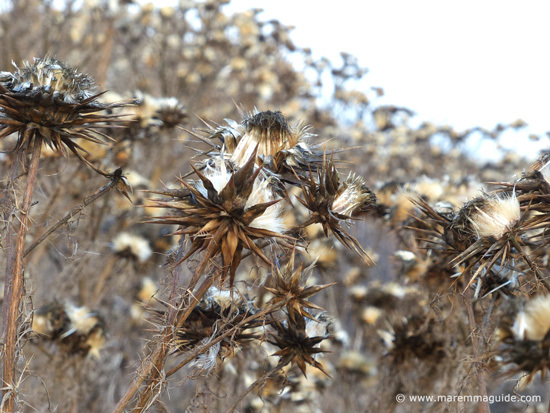 You can still see fields of sunflowers in Tuscany in July and August: the June flowers will be burnt brown, but the later seeded crop will have taken their place in neighbouring fields.